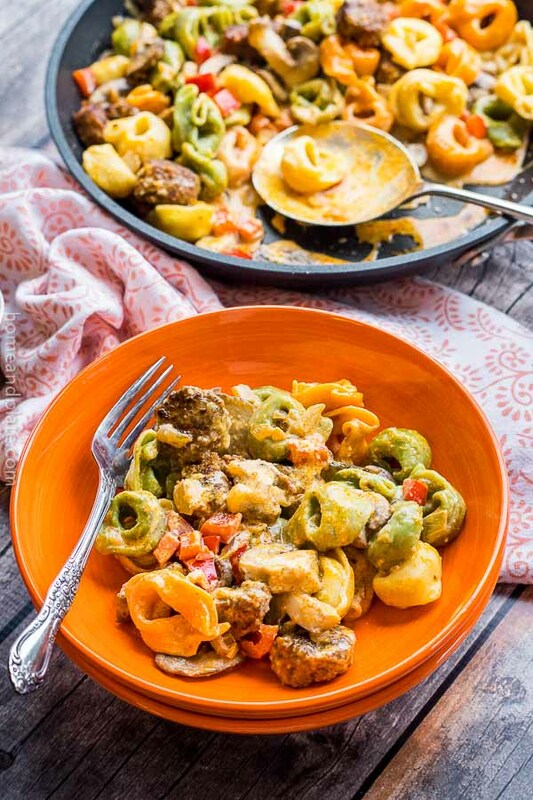 Basil Pesto Vegetable Pasta with Shrimp – a weeknight dinner that uses spiralized vegetables and pasta for a delicious easy dinner in under 30 minutes! Cutting back on carbs? I love a big bowl of pasta filled with fresh vegetables, flavored with basil pesto and sautéed shrimp. But I could do with more veggies and less pasta. 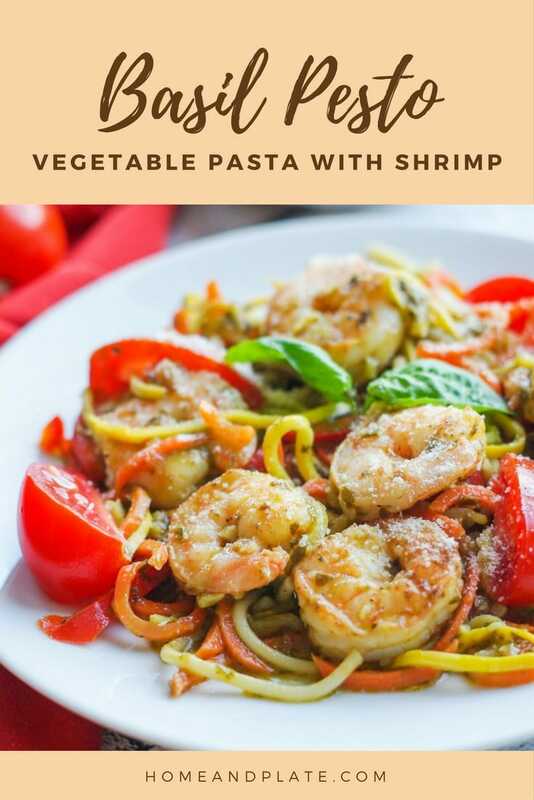 So I swap out half of the pasta for spiralized veggies in this delicious shrimp and pasta recipe. It’s healthier for you and just as delicious. Spiralized vegetables are the hot trend right now. Fresh zucchini, carrots and squash are easy to turn into zoodles, a veggie noodle. Amazon has plenty of different veggie spiralizers but I found mine at the grocery store. I wanted something that would fit in a drawer and wouldn’t require being pulled out onto the countertop. The fewer contraptions the better. I’ve listed a few spiralizer suggestions (*affiliate links) below. Once the veggies are in zoodle form, they are easy to sauté and cook up in no time. And they add incredible flavor to just about any recipe. I added sautéed shrimp and a dollop of basil pesto to amp up the flavor of this dish. How do I cook the zoodles? The trick is to not overcook the vegetables. Nobody likes mushy veggies! I prefer them crisp with a little bit of bite. Less than five minutes in the pan. 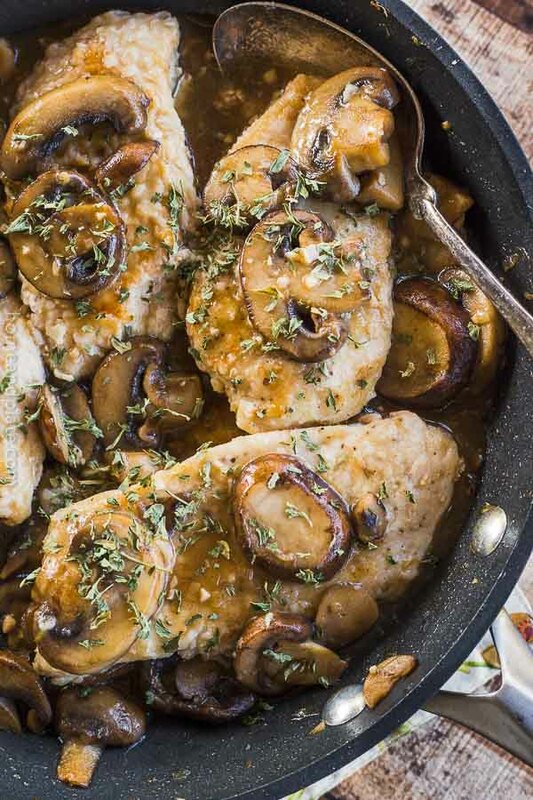 This dinner pulls together in under 30 minutes. I usually spiralize the veggie noodles ahead of time and purchase my shrimp already peeled and deveined. The hardest part is making the pasta. So next time you’re craving pasta, trim the carbs and replace them with veggie noodles. 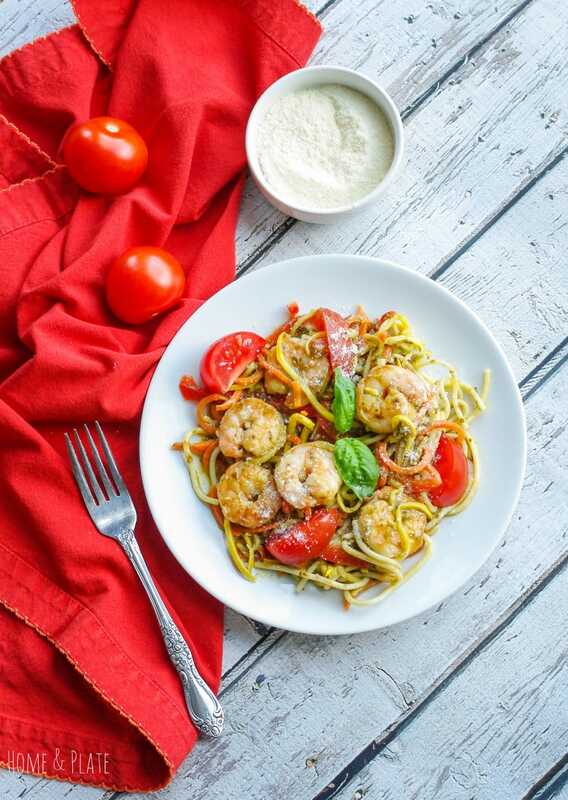 Basil Pesto Vegetable Pasta with Shrimp - a weeknight dinner that uses spiralized vegetables and pasta for a delicious easy dinner in under 30 minutes! Prepare the pasta and cook until al dente. Reserve one cup of the pasta water then drain and set aside. Add the butter and the olive oil to a large pan. When the pan is hot, add the shrimp, season with salt and pepper and cook for 3-4 minutes a side, until pink. Remove the shrimp from the pan and set aside. Place the squash, carrots, and red pepper in the pan and sauté the spiralized vegetables for about three minutes to soften. Add the tomatoes to the pan and cook for one more minute. Add in the pasta, pasta water and the basil pesto. Toss until the sauce has loosened and the noodles and veggies are well coated. Add in the shrimp, sprinkle with Parmesan cheese and serve. 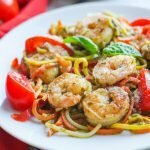 "description": "Basil Pesto Vegetable Pasta with Shrimp - a weeknight dinner that uses spiralized vegetables and pasta for a delicious easy dinner in under 30 minutes! 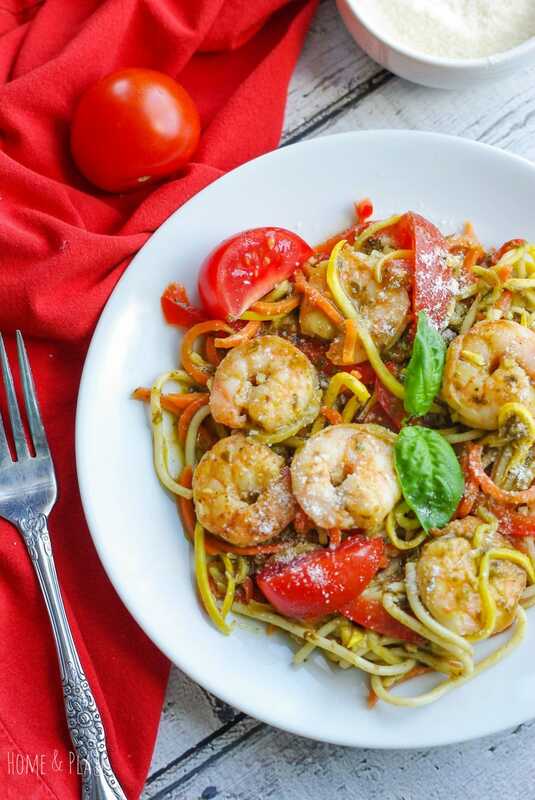 ", "recipeIngredient": [ "1/4 pound spaghetti, cooked (1/4 of the box)", "", "1 yellow squash, spiralized", "", "1 carrot, spiralized", "", "1 red pepper, sliced thinly", "", "4 Campari tomatoes, quartered", "", "1 pound shrimp, peeled and deveined", "", "2 tablespoons butter", "", "1 tablespoon olive oil", "", "1/4 cup basil pesto", "", "Parmesan cheese", "", "Salt and pepper" ], "recipeInstructions": "Prepare the pasta and cook until al dente. Reserve one cup of the pasta water then drain and set aside. What a great idea to swap out half of the pasta! Then you have the best of both worlds! Lovely photos as usual Ali!! Lightens it up for sure and you have the best of both world indeed. 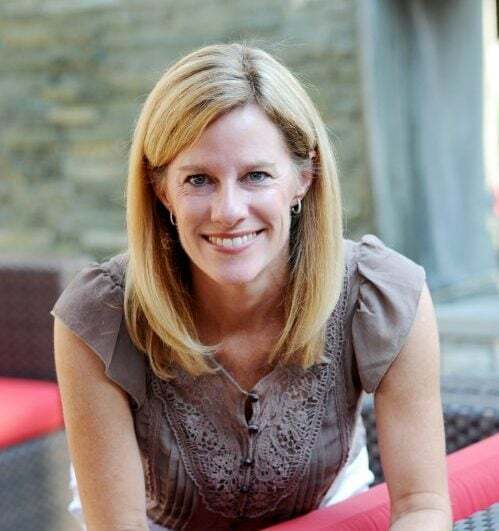 Thanks Beth. The shrimp looks so tasty! What a healthy dish. I love veggie pasta. So do I! I love using my spiralizer for all sorts of recipes. 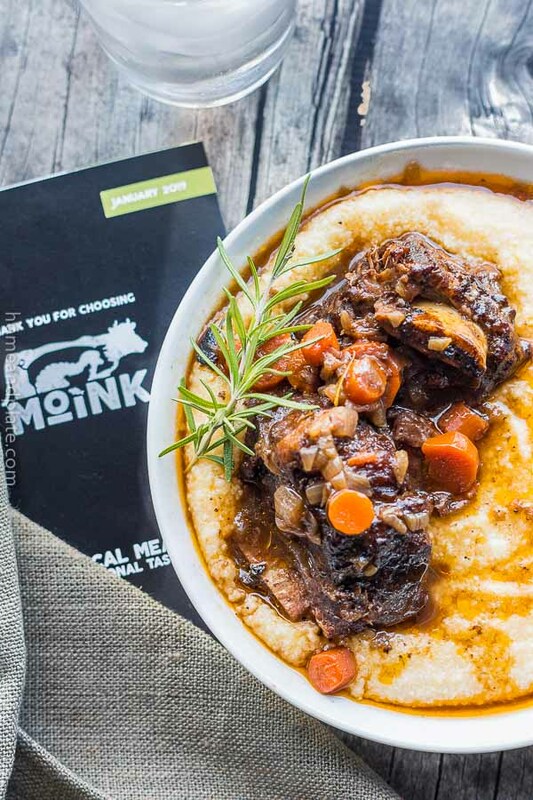 This dish is a new family fave. Totally Yumm! Love shrimps as its my family fav! We have been eating a lot of shrimp lately too. So good in this pasta.